In this contribution we are looking at communication values that express cultural style as coded in language. In the diagram below is our iceberg where we can see that Americans tend to prefer a “can-do” approach while Germans value “Klarheit”, or clarity. This particular difference tends to cause friction between these two cultural groups without it ever being detected. To illustrate, let’s begin with a short dialog between a German and an American working professional. John, the American client has expressed the desire to have a particular change in a product that Wolfgang, the German employee from the supplier company, is developing. Let’s pay particular attention to the way the German developer disagrees with the American client’s suggestion. With a trained eye, or ear, it is possible to recognize communicative values particular to Germans and Americans. John: So this new change should really round out the product. We want to make sure our end customer gets a lot for his money. The trend is moving in that direction too. Wolfgang: Yes but uh the problem is that we started this project and all this plannings uh around three months three months before and uh all our budgets and all the development had been based on this first inquiry of you. So we had received in the meantime all our quotations from suppliers from the software company and uhm all the project has been uh developed on this uh this […?] so and even the first field tests had started and so we, I think if we make any changes now we will have a financial problem here also. Because changes mean new development and meaning additional staff and uh time consuming… additional costs. Wolfgang: So what I can offer now I can uh we can make uhm a meeting with our project team and we will check how big this new change will involve the the status of the project now and I will let you know maybe by tomorrow then. Maybe if this helps in the meantime and tomorrow we will talk again. American working professionals value a “can-do” approach to decision making processes, in which ideally, one looks at a situation and focuses on finding solutions, quickly. An employee who is good at finding creative solutions is considered to be “pro-active”: a highly prized characteristic in American society. Germans on the other hand focus on “Klarheit” and the quality of their product. In the dialog, the “can-do” approach emerges when John says: “anything is possible if you want it to be”. In addition, John has communicated a pro-active style when he suggested making pre-emptive alterations in the product. At the home office, John’s ability to be one step ahead of the needs in the market is likely to be recognized and valued by his boss. This is not to say that Germans don’t think similarily, rather what I am pointing out is that Americans are known to make continual alternations during a product development even if these cancel earlier decisions. Germans tend to feel this is a poor engineering decision because projects are planned in detail and should not be adjusted. This is b because alterations imply the engineering team was not thorough during the planning stage. Therefore, Wolfgang is more than likely to want to disagree. The German value of clarity can be seen in the way Gerhard disagrees with John. His strategy was to remind John of the history leading up to the dialog between them. In addition, Wolfgang argued his position with information, facts and technical details. Also note how quickly the disagreement occurred: he came straight to the point with a very short token agreement (i.e., yes, but). There are times when Americans express a direct disagreement, but usually about less important topics. In this situation Gerhard is the supplier who is talking to his client, which to an American is important and requires a more indirect, softened style. While the need to disagree is apparent, an American may take more time to show a person oriented style by extending the token agreement, and focusing on points that indicate agreement. In contrast, Germans tend to value clarity and discussion in the process of finding a solution. By presenting information one shows cooperation and good-will. In addition, the receiver doesn’t need to interpret the meaning or assume the speaker’s intentions. In Wolfgang’s world, an employee is valued for their ability to show technical know-how by pointing out the “problems” connected with suggestions. Critical thinking is highly valued and often misunderstood by Americans who expect a can-do approach. The result is the German feels a topic is not properly discussed if one does not look at ideas critically. From this point of view, behavior appears to be superficial, uninformed, and too simple. The American on the other hand feels the German is communicating “no” each time he says: “the problem is” or “yes, but”. The American is not aware that the need to find “clarity” through critical discussion is actually a show of service oriented behavior. Germans can be painfully honest. As an American living in Germany I had to learn to accept and expect the naked truth because it can really take you by surprise. Today it makes me smirk, but in the past it used to really hurt. Today I held a seminar for a well-known German company in which my job was to explain how American work culture operates. This company deals with American suppliers and customers and they find Americans behave rather curiously, if not very strange. At the end of a seminar I usually ask the participants what they found especially interesting or surprising. One man told me that he doesn’t particularly like Americans. Clunk! He went on to say that they talk too much when they should be quiet and listen; and they say nothing when they should give a response. They are too sensitive when it comes to differences in opinions and are not honest enough. I should explain that in Germany not everyone in likes to be this honest, but it is a behavior I frequently encounter here. This man made this statement to an American and felt no remorse, nor embarrassment; however, I was able to see by their reactions that a couple of people in the room found it a bit too direct. How can this honesty be explained? How is it cultural? 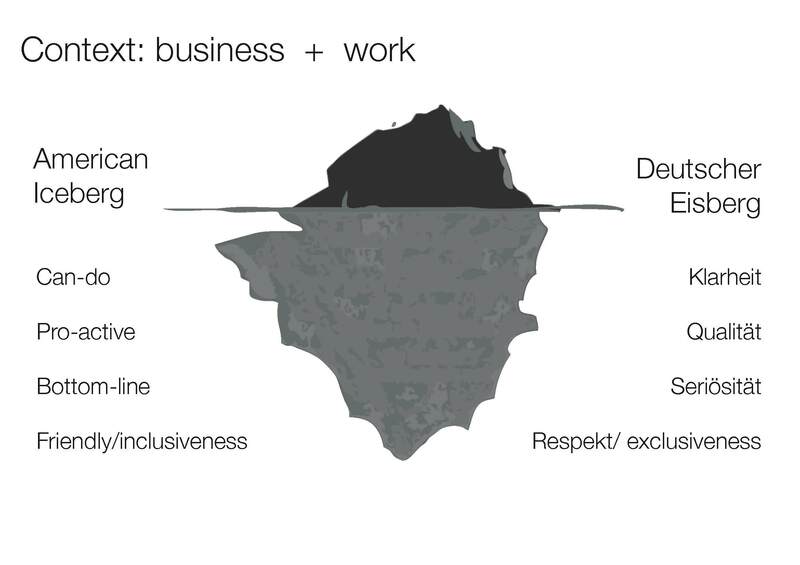 If we refer back to the cultural iceberg (see my earlier blog contribution Metaphors of Culture) we see that Klarheit, or clarity are values important to Germans. This means that in the best case, topics are discussed freely and it is believed that opinions should be accepted even if they differ from those of others. The ability to be completely honest is seen as a sign of a sovereign, incorruptible person. Even if another individual prefers to be less honest, a clear statement from a more open individual is respected and even revered. Americans also value honesty; however, there are times in which the potential impact of such a statement is considered to be harsh. The belief is that such honesty may cause the receiver to lose face, which in turn can cause the speaker to appear unfeeling and lacking in politeness. It is exactly this sort of thinking that makes Germans feel Americans are superficial and too sensitive. They feel that the truth is always better than saying nice words to make someone feel comfortable. These two attitudes towards honesty are deeply ingrained ways of seeing the world. In other words, a German cannot be expected to tell a “white lie” (eine harmlose Lüge um das Gesicht der Andere zu bewahren) because it is contrary to their upbringing. German parenting does not include a lot of praise as a means to build up child self-esteem, as it tends to in American families. Americans on the other hand cannot be expected to express their true opinions if they think they may hurt someone since they tend to grow up hearing: “if you have nothing nice to say, don’t say anything at all”. Such honesty does occur in American communication but it tends to be regarded as a way to intentionally hurt the receiver. And in Germany there are times when the truth is held back but this behaviour is not necessarily seen positively since it could mean that the speaker lacks in self-confidence. So what did I do during the training? Today this sort of behavior doesn’t upset me as it did in the past. I used to feel confused, embarrassed and upset; ready to strike back. Today I understand that this remark is not meant to hurt me – it is only a means to share an opinion. The speaker feels a responsibility to express this since the context is a seminar where one is allowed to discuss their opinions openly. Such a statement is not to be taken personally because it is not about me as a person. But I can imagine how an unsuspecting American would feel if they were to receive this kind of ‘brutal’ truth. Frau Schmidt or Anna: What’s in a first name?